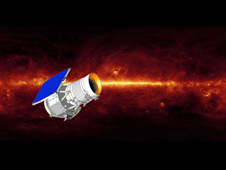 NASA’s Wide-field Infra-red Survey Explorer (WISE) was a highly successful short-term mission to map the sky in infra-red wavelengths. Equipped with 4 infra-red detectors (operating at different wavelengths, correlating to different temperatures) and cooled to a frigid 260°C below zero, it was able to reveal an unprecedented view of both the universe and our own Solar System. In the course of performing a second pass of its initial sky survey, it discovered 19 comets and more than 33,500 asteroids, including 120 near-Earth objects. Sadly, as reported earlier, WISE was only equipped with enough solid hydrogen coolant to complete the original mission, and was scheduled for retirement and eventual re-entry when the coolant ran out. But in a surprising turn-around, the JPL issued a press release yesterday announcing the decision to keep WISE operational. It’s tremendous success in mapping cold dim objects within the Solar System has shown that it can still do valuable work, even though it is no longer capable of the kind of science for which it was originally designed. WISE’s new mission is to find and chart comets and asteroids, and will also be used to observe Brown Dwarfs beyond the Solar System. This is fantastic news – I was always a little sad that such a productive and successful observatory should be shut down after so little time. I am very pleased to see we are able to recycle existing hardware for new missions, and not simply shut it down and allow it to burn up in the atmosphere.